I know that we are not quite in to summer season, but a nice salad is always good on the side of a meal. Or, if you are like me, then you are eating salad as a main meal all throughout the year too. The most popular salad dressings tend to be creamy, and full of fat ones. It is easy to see why – they are delicious, but they can carry a couple of hundred calories (sometimes more) in just the dressing alone. That doesn’t mean you have to settle for plain lemon juice, as it is easy to make a full of flavour and healthy salad dressing. I talk about salads a LOT, and it has led me to have the reputation amongst family members as a rabbit, although I think I eat far more salad than a rabbit. I have a lot of people telling me that salads are boring and my response to that is that you are making them wrong. If you have the same plain salad all the time, then of course it is going to be boring, but salads are so versatile and the dressing has a lot to do with that. When I am not feeling very creative and I don’t feel like making up a new dressing, this is my go-to dressing as it pretty much goes with any salad. It is light, uses ingredients I usually always have in my kitchen and it is healthy too. I have added some Greek yoghurt to it in the past to give it a bit of creaminess, and I have also added some honey to add a hint of sweetness, but this is my basic lemon vinaigrette. I recently got sent a Salad Zinger from Root 7 to try out and I love it. It makes making salad dressings ridiculously easy. You don’t need to chop everything by hand, you literally just put your “hard” ingredients, like the garlic and herbs in the bottom and twist it so it chops it all up using the blades that are built in to it and then you add the liquid, shake and it all infuses. SO easy. 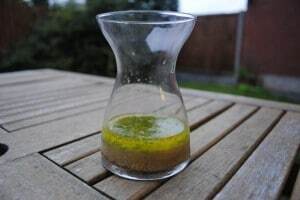 I have also used it to make my own flavoured oils for cooking as well. I also got sent an Aqua Zinger, which is the same concept, but for making flavoured water. You add fruit in to the bottom and add things like honey, ginger, mint, cayenne, anything you want, and it instantly makes water more interesting. I am currently drinking a lemon and ginger water using another product they sent, the Citrus Zinger. I will be posting more about flavoured water another time. This dressing will keep for around 3 days in the fridge too. – A pinch of sea salt and black pepper. 1) Put the garlic, dijon, chives and salt and pepper in to the bottom of the Zinger and twist and then add the liquids to the top and shake. If you don’t have a Zinger, then you can mix everything by hand in a bowl. What is your favourite salad dressing? Leave a comment below and a healthy version of it might be the next salad dressing recipe. Oh I love salads and they are most definitely NOT boring! The more ingredients in them the better! I like the zingly lemony flavours in this vinaigrette. Great way to liven up salads.